In other cases, it's been much more direct. In Annie Hall, - aka "the other ultra-influential classic from 1977" - writer/director/star Woody Allen broke narrative conventions in a manner usually reserved for zany comedy in the context of an adult comedy about a doomed relationship between his Alvy Singer and Diane Keaton's "Annie" of the title. Characters turn away from the scene to address the audience directly, wander into and out of each others' dreams and memories, disengage from the physical bodies to comment on events, etc. In the film's most-famous "WTF?" moment, Alvy is stuck in line listening to a know-it-all spout misinformation about philosopher Marshall McLuhan. The two argue, both of them asking for the audience to back them up, but Alvy finally wins by reaching off-screen - into what some of us would now call "Hammerspace" - and producing McLuhan himself! "You know nothing of my work!," declares McLuhan. At the time, this was all revolutionary stuff - though the film was both popular and well-received enough to win that year's Academy Award for Best Picture. Plenty of critics and plenty more audiences couldn't quite figure what Allen, a onetime stand-up comedian previously known for light screwball comedies, was up to. But a certain generation and echelon of folks who'd come up marinating in the same pop-culture brew of classic movies, foreign films, high philosophy and low comedy as Allen got the language of the piece, making it allowable and eventually desirable for other filmmakers to use the same type of devices. Today, what was then the cutting-edge/highbrow Annie Hall style of comedy-narrative is so culturally ingrained that it forms the bedrock of shows like Family Guy - which hardly anyone considers either highbrow or revolutionary. On a long enough timeline, Annie Hall and Scott Pilgrim look very much of a kind, and not only because they're both stories of socially-awkward nerds living in not-quite-reality and negotiating relationships with difficult, free-spirited women. Diane Keaton, as Annie, was the Subject Zero for a character type now commonly known as the "Manic Pixie Dream-Girl" - a type that Mary Elizabeth Winstead's "Ramona Flowers" is intended as both an example of and a commentary on in Pilgrim. Will they mirror each other's impact the way they mirror each other's subtext? Woody-produces-McLuhan, Scott-gets-a-life, same-difference? Maybe, maybe not. After Annie Hall, it was okay to use fourth wall breaking (read: talking to the audience) as a narrative device to move the story along, and to yank physical punchlines in from the sidelines. A year after Scott Pilgrim, will more youth-targeted comedies be borrowing the shorthand of games and manga to pump up the story or rebrand tired metaphors? No one can say for sure. But it's very possible that one day, some of us will be watching some character or another unremarkably 1-Up his way into metaphoric reincarnation in this or that movie and be able to recall, fleetingly, the days when that was a bold new idea, and how at the time few people noticed how quickly everything changed. 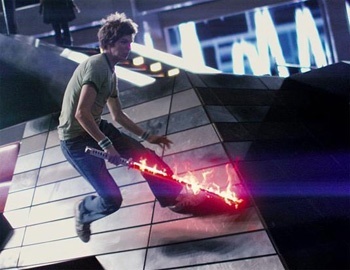 Note: Fans of Scott Pilgrim or of similarly-themed movies in general? Yes, this means you should go watch Annie Hall. Yes, even if you've decided you don't like Woody Allen movies. It's the ur-text of modern male-P.O.V. romantic comedies.